In a way we reverted to performing live in the studio, without venturing too much into the world of over-dubs. This change in style payed off big time, A Question Of Balance rocketed to #1 in the UK and #3 in the US charts. The opening track ‘Question’ is one of The Moody Blues finest compositions, written against the backdrop of the Vietnam War it is very much a protest song. Question was released as a single and within two weeks was charting at #2, and it remained on the charts for almost 3 months. By rights it should have made #1, but was beaten out by what is referred to as a ‘novelty’ single put out by the English soccer team (not well known for their musical prowess, but certainly a crowd pleaser back then). A Question Of Balance is probably the most ‘Main Stream’ album The Moody Blues has ever released. While one cannot argue as to the commercial success of it, I personally think it is one of their weaker efforts. To me the lush studio tracks are what makes The Moody Blues, and stripping that layer off leaves an almost not complete feeling. I could be wrong! You decide. You can pick up your copy in better record stores, or online from Amazon. 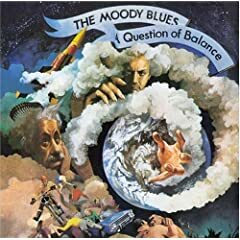 1 user commented in " CD Review: A Question Of Balance by The Moody Blues "